Note that Goetz's proposal should not be confused with the 1997 version of Oracle's Project Valhalla that is described as "the code name for Oracle's flexible Java development environment for building, debugging and deploying component-based applications for the network computing platform." This "other" Project Valhalla is also described in the 15 December 1997 edition of InfoWorld: "Code-named Project Valhalla, the Oracle AppBuilder for Java is slated to ship in the first quarter of 1998. The Java tool, which is based on Borland's JBuilder Java IDE, is designed for writing n-tier, thin client applications." The "other" Project Valhalla became AppBuilder for Java and was included with JDeveloper Suite (15 April 1998). The Oracle Application Server (4.0 at the time) that was part of this same JDeveloper Suite has new company at Oracle with Oracle's acquiring WebLogic with the BEA acquisition and acquiring GlassFish with the Sun acquisition and JDeveloper is an Oracle-provided (free in the "free beer" sense, but not open source) Java IDE. Returning to the "next generation" of Project Valhalla, the voting on this Goetz proposal closes on 7 July 2014. Several have already expressed "yes" in replies to Goetz's original e-mail post. In that forum, Patrick Wright asked, "how is this/will this be different from the Da Vinci Project/MLVM?" and John Rose answered that "the charter for Da Vinci is to incubate JVM features for languages other than Java ... or for general language support without associated Java language changes" while "Valhalla is intended to support the evolution of Java itself." I was excited about Project Coin when it was announced and enjoyed reading and hearing about its progress, but Project Valhalla would be much more ambitious and much more exciting if it is investigated and some or all of the proposed features are implemented. 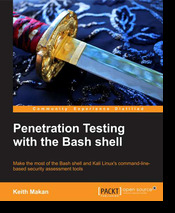 This post is my review of the Packt Publishing book Penetration Testing with the Bash shell by Keith Makan. I think it's important to emphasize its subtitle: "Make the most of the Bash shell and Kali Linux's command-line-based security assessment tools." As the main title and sub-title suggest, this book is about penetration testing with Bash using the Kali Linux. The book has approximately 125 pages covering 5 chapters. The Preface of Penetration Testing with the Bash shell begins with an articulation of why it is important for penetration testers to be familiar with command-line tools. The Preface also provides brief summaries of each of the five chapters in the book and some of the command-line tools covered in each chapter. Under the "What you need for this book" section of Penetration Testing with the Bash shell's Preface, Makan writes, "The only software requirement for this book is the Kali Linux operating system, which you can download in the ISO format from http://www.kali.org." You don't necessarily need to use Kali Linux as many of the bash examples and described command-line tools are also available with or for other Linux distributions. The "Who this book is for" section of the Preface states, "Command line hacking is a book for anyone interested in learning how to wield their Kali Linux command lines to perform effective penetration testing." The initial chapter explains that "throughout the book, the bash environment or the host operating system that will be discussed will be Kali Linux" and that "Kali Linux is a distribution adapted from Debian." The chapter then goes onto explain with text and examples Bash concepts such as man pages and bash commands such cd, ls, pwd, and find. The chapter also describes using Linux redirection (output and input) and pipes before concluding with a discussion of grep and regular expressions. As the author suggests, this chapter could be generally be skipped by developers familiar with Linux, but would be must-read information for those new to Linux. Although Kali Linux is used for the examples, I didn't see anything in this initial chapter that seemed specific to Kali Linux. The second chapter of Penetration Testing with the Bash shell begins with coverage of terminal control sequences to change appearance of text in the terminal. The chapter builds upon this information to demonstrate customization of the terminal prompt. Chapter 2 also introduces aliases, customizing command history, and customizing tab completion. Like the first chapter, this second chapter covers additional general Bash concepts rather than specifics of penetration testing. Chapter 3 of Penetration Testing with the Bash shell transitions from coverage of Linux and bash to "move on to using the shell and the Kali Linux command-line utilities to collect information about the networks you find yourself in." The chapter examines tools such as whois, dig, dnsmap, Nmap, and arping. Penetration Testing with the Bash shell's fourth chapter focuses on reverse engineering and tools that "may enable you to discover memory corruption, code injection, and general data- or file-handling flaws that may be used to instantiate arbitrary code execution vulnerabilities." Tools covered in this chapter include Metasploit (including command-line msfcli, mixing msfcli with bash commands and other command line tools, msfpayload, Meterpreter), objdump, and GDB. The fifth and final chapter of Penetration Testing with the Bash shell focuses "on the network exploitation available in Kali Linux and how to take advantage of it in the modern bash shell environment." This relatively longer chapter begins with discussion of "Media Access Control (MAC) spoofing" and "Address Resolution Protocol (ARP) abuse." The chapter looks at tools such as macchangeer, ifconfig, arpspoof. Chapter 5 describes man-in-the-middle (MITM) attacks and provides a detailed introduction to ettercap. The chapter also explains server interrogation and describes tools for Simple Network Management Protocol (SNMP) interrogation (snmpwalk and Metasploit's snmp_enum and snmp_login) and for Simple Mail Transfer Protocol (SMTP) interrogation (smtp-user-enum). There is a section in Chapter 5 on brute force authentication that demonstrates use of Medusa. The section of Chapter 5 on traffic filtering demonstrates use of TCPDump. SSLyze is demonstrated as a tool for "assess[ing] SSL/TLS implementations" and SkipFish and Arachni are demonstrated as tools for scanning web pages and web applications for vulnerabilities. The electronic version of Penetration Testing with the Bash shell that I reviewed included numerous colored screen snapshots. I liked the "Further Reading" sections at the end of each chapter that provided links to online information with more detail about subjects covered in the chapter. The first two chapters of Penetration Testing with the Bash shell have very little information specific to penetration testing but provide an overview of some bash features used in later chapters. The third, fourth, and fifth chapters are heavily focused on penetration testing and build upon the bash basics covered in the first two chapters. Penetration Testing with the Bash shell provides background information on various security and assessment concepts as its illustrates the tools available that are related to those concepts. There are some awkward sentence structures in Penetration Testing with the Bash shell and several of the sentences are too long for my taste (especially early in the book), but I was generally able to make out the intent of the writing. An example of the occasional awkward but understandable text is on the first page of the first chapter: "Why are discussing the bash shell?" Although this book does mention Kali Linux specifically and frequently, the majority of the described tools are available as built-in tools or as tools that can be installed separately with other flavors of Linux. With no or just a a bit of effort, one could run the examples in different Linux implementations. It's also worth pointing out that the author repeatedly mentions that several commands runs with no special effort in Kali Linux because things are run as root. In other Linux implementations, you may need to use sudo to apply these tools. Although I am fairly familiar with bash, I still learned a few new things from the first two chapters (primarily the second chapter). I am far less experienced with penetration testing and learned quite a bit from the other three chapters. Penetration Testing with the Bash shell: Make the most of the Bash shell and Kali Linux's command-line-based security assessment tools outlines how bash in general and Kali Linux in particular provide command-line security assessment tools. The book introduces the tools and how to apply them and explains security-related concepts along the way. The Agile Manifesto started a movement that resonated with many software developers frustrated with inefficiencies and inadequacies of prevalent software development methodologies. Unfortunately, the relatively simple concepts of the Agile Manifesto were interpreted, changed, evangelized, commercialized, and sold in so many different ways that it became difficult to uniquely describe agile. To some, agile became synonymous with "no documentation" and to others agile meant going straight to coding without any process. So many disparate methodologies and practices are now sold as agile that it's become increasingly difficult to describe what makes something agile or not. There have been several negative consequences of the multiple interpretations of what agile means. Implementation of so-called agile practices without understanding of agile can lead to failures that are blamed on agile, but which failures may have little or nothing to do with agile. Unrealistic expectations of agile and what it can do for development can lead to inevitable disappointment as there still is no silver bullet. It is difficult to help new developers, developers new to agile, managers, customers, and other stakeholders understand what agile is and how it may or may not be appropriate for them with so many different interpretations. I was at a presentation by an agile enthusiastic several years ago when he suggested that agile was anything that was successful and was not anything that is not successful. For me, "agile" means processes and approaches that closely match the values outlined in the Agile Manifesto (individuals and interactions, working software, customer collaboration, and responding to change). There are other approaches and methodologies out there that may be useful and positive, but if they aren't inspired by these values, it is difficult for me to hear them called "agile." Roy Fielding's dissertation Architectural Styles and the Design of Network-based Software Architectures popularized the term Representational State Transfer (REST). Unfortunately, many have used REST and HTTP interchangeably and in the process have muddled the conversations about both the REST architectural style and the Hypertext Transfer Protocol (HTTP). It is easy to see from a historical perspective why REST and HTTP are often treated interchangeably. REST embraced the functionality already provided by HTTP as a significant part of its architectural style at a time other popular architectural styles and frameworks were doing everything they could to hide or abstract away HTTP specifics details. REST leverages HTTP's stateless nature while others were trying to wrap HTTP with state. Although REST certainly played a major role in raising awareness of HTTP, REST is more than HTTP. I have found that many who think of REST and HTTP as one and the same don't appreciate the HATEOAS concept in REST. HATEOAS stands for Hypermedia as the Engine of Application State and refers to the concept of application state being embodied within the hypermedia exchanged between server and client rather than in the client. I've known of clients and managers filled with dread when they hear a developer state that he or she is going to "refactor" something. The reason is that "refactoring" too often means the developer plans to change the code structure and "improve" or "fix" behavior as part of this. Refactoring is supposed to be code improvements that do not effect the results of the software but lead to more maintainable code. Too many developers are lured into making other changes "while they are in the code" that change results. Even when for the better, these changes are not in the spirit of refactoring and so, when they have led to breaking of existing functionality, have led to "refactoring" being seen in a bad light. Comprehensive unit tests and other tests can help ensure that refactoring does not change any expected behavior, but developers should also clearly understand whether the goal is to maintain current functionality with improved code structure (refactor) or actually change/improve functionality and only use the term "refactoring" when appropriate to avoid confusion. I generally agree with the principle behind the now famous quotation, "Premature optimization is the root of all evil." However, my interpretation of this is that one should not write less maintainable or less readable code in an attempt to achieve small expected performance gains. However, as I posted in When Premature Optimization Isn't, this term occasionally gets used as justification for not making good architecture and high-level design decisions just because they have a performance benefit associated with them. Some architectural decisions are difficult to change at a later point and performance does need to be accounted for. Similarly, even at implementation level, there are times when better performing code is as readable and easy to write as less performing code and so there is no good reason to not write the better performing code. The term NoSQL was an unfortunate one for a class of databases that probably would have been better labeled "Not Relational." As numerous "NoSQL databases" have adopted SQL (without adopting the relational model), alternative terms have been tried such as "Not Just SQL." The term "open source" has often led to confusion about whether the software in question is "free" in terms of "freedom" (libre/free speech) and/or "free" in terms of no monetary price (gratuit/free beer). There can even be confusion about the minor differences between "open source" and "free software." For me, "open source" means source code that I can look at and modify as necessary. I generally despise everything about the idea of source line of code. The appeal of SLOC is the pretense that somehow lines of code can be counted the same as beans and widgets. All lines of code are not created equal and there are differences in lines of code across different languages, across different developers, and across different functionality. Some have even gone so far as to think that more SLOC is always a good thing whereas I've found that more concise code with fewer lines of code can often be preferable. I have blogged before on lines of code and unintended consequences. This one is not a big deal in terms of negative consequences from its misuse, but it is worth noting that SOAP no longer stands for Simple Object Access Protocol. This is another one that doesn't really lead to any problems even though it technically has never stood for Java Database Connectivity and is not even an acronym. The fact that it does indeed relate to connecting to databases, that it is Java-related, and that it is so widely said to stand for Java Database Connectivity means that this misuse of the term JDBC has no significant negative side effects. In fact, I suspect that Sun Microsystems folks intentionally wanted people to think of it as an acronym for Java Database Connectivity while explicitly stating that it was not an acronym because it allowed people to quickly understand what JDBC is via their awareness of ODBC. The incorrect use of many of the terms discussed in this post could be described as largely pedantic, but misuse of a few of them can lead to miscommunication and general confusion. In some cases (such as "agile" and "refactoring"), the misuse of terms has led to negative experiences and soiled reputations for those terms. In other cases (such as using JDBC and SOAP as acronyms when they really are not acronyms), the confusion seems small and harmless as everyone discussing the falsely advertised "acronym" seems to understand what it implies. 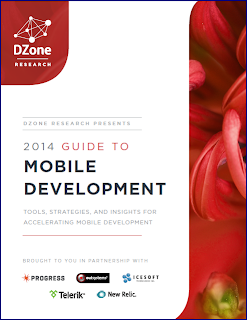 DZone is launching the public release of its DZone's 2014 Guide to Mobile Development today. The 35-page PDF is intended to be used with the DZone Mobile Development Research site to "explore the mobile application development landscape, examining best-practice strategies and comparing tools and frameworks that accelerate mobile development." For those desiring an "executive summary" of the state of mobile development as described in DZone's 2014 Guide to Mobile Development, a single page (page 3) contains a paragraph and five bullets summarizing what the guide covers along with four "key takeaways" from the mobile development research. The "Key Research Findings" section (pages 4 and 5) includes summary text and colorful graphics to illustrate results of surveys of mobile developers. The findings include things such as types of mobile developers, types of mobile applications being developed, and common timeline for mobile app development. Pages 6 and 7 of DZone's 2014 Guide to Mobile Development look at developing mobile apps as web apps, as native apps, and as hybrids of those. Pages 10 and 11 elaborate more on the "state" of apps that are native, web-based, and hybrid and presents a table of 7 comparison factors for the three approaches. Pages 14-15 of DZone's 2014 Guide to Mobile Development discuss issues related to integration of mobile applications with back-end enterprises. Pages 21-22 discuss perceived performance versus actual performance metrics. 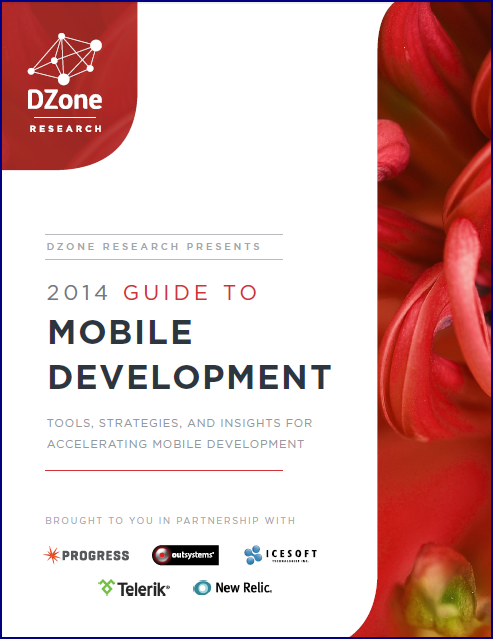 The 23rd page of DZone's 2014 Guide to Mobile Development features a "Mobile Application Development Checklist." Pages 24-34 are the "Solutions Directory" and it is this section that may be of most interest to those trying to decide on tools, frameworks, and platforms to use in their new mobile development projects. Each "solution" has a brief description listed along with certain characteristics (the set of characteristics depend on whether it is a framework, mobile application development platform [MADP], or both). The DZone 2014 Guide to Mobile Development also includes several pages of full-page advertisements as well as pages split in half with the top half containing text about a mobile development issue and the bottom half containing an advertisement for a related solution addressing the need discussed in text. These half-page text sections and associated advertisements are typically written by "research partners" (Progress/Progress Pacific, Outsystems/Outsystems Platform, ICEsoft/ICEmobile, Telerik/Telerik Platform, and New Relic Mobile Monitoring). The DZone 2014 Guide to Mobile Development is a polished product that will likely be of most benefit to those considering starting mobile application development or those just entering mobile application development. Although it contains ideas likely to interest even more experienced mobile application developers, much of it is introductory in nature. Experienced mobile developers who want to see what others are doing will also find the research findings interesting and may find it useful if they are looking for an alternate framework or MADP to adopt. This report is not a highly detailed, but instead focuses on high-level trends, survey results, and product offerings that affect mobile development. The sections of DZone's 2014 Guide to Mobile Development that I found most interesting are the Summary and Key Takeaways, Key Research Findings, Cross-Platform Problems and Solutions, The State of Native vs. Hybrid vs. Web, the checklist, and the Solutions Directory. Reading this report has helped solidify some of my opinions by providing background and support, has helped me increase my understanding of a couple things, and helped me to think about some common mobile development issues from a different perspective. I also was able to read about some frameworks and MADPs that I had not previously been aware of. In short, this report provides a succinct and well presented summary of the overall current state of mobile development.